It’s unfair to say one feels let down by a free program. It’s more unreasonable to feel let down by a non-performer’s performance. Alas, several of us did; I asked around afterward. 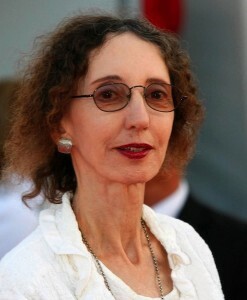 Writer Joyce Carol Oates, 75, still teaching at Princeton and other campuses, was fascinating for her 45 minutes onstage at the Fayetteville Town Center on Monday, April 21. Suddenly, it was all over but the book-signing. She was the 2014 Distinguished Reader of the Programs in Creative Writing & Translation of the English department of the University of Arkansas. Earlier in the day, Oates met with Master of Fine Arts students. After two introductions, Oates went onstage about 7:15, and the several hundred seats were over three-fourths occupied. She ended at 8, noting there would be no Q-and-A. In between, the noted author was delightful. She read one story, an older one, “Small Avalanches,” the title piece from a collection. Oates to a modest but effective extent acted the parts of the narrator, a naive 13-year-old girl, and other characters, even gesturing at points with hand movements and shoulder shrugs. The second half of her presentation was a reading from a draft of a memoir she is calling The Lost Landscape: A Writer’s Memoir. The section concerned her parents and some grandparents. She read this quickly with no drama. Before reading the fiction, Oates emphasized how she rarely writes in her own voice. It helps her, she said, to move through the cadences and inflections of the voice of the main character. Her stories, she said, are mixed from three sources: made up (invention), acquired (observation) and self (memory). After “Small Avalanches,” where the young narrator is walking home followed by a man with apparent bad intent, she noted which parts came from which. It was slight but sufficient for my literary evening, to learn Joyce Carol Oates’ view of “made up, acquired and self.” After all, she’s published more than 50 novels, dozens of short story, essay and poetry collections, and books for children and young adults. She gave us a big clue. Also linked here, Kyle Kellams has a great interview with Oates, aired last week on his Ozarks at Large. 7:15.